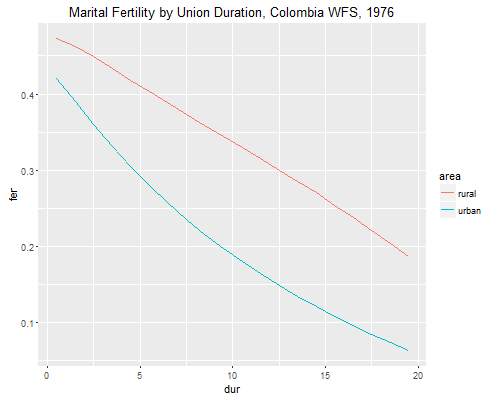 We apply Page's model of marital fertility by age and duration to study urban-rural differentials in Colombia, following essentially the procedures in Rodríguez and Cleland (1980). We will work with an extract from the 1976 WFS that has the dates of R's birth, first union and interview, the birth history, and type of place of residence. We will focus on fertility in the three-years before the interview. A woman starts contributing events and exposure 36 months before the interview or when she enters a first union, whichever occurs later. We create the variables bot and top to mark the start and end of exposure. a local macro zj paste() to construct the names with zero-padded birth numbers. 2.       local zj = "`j'"
3.       if `j' < 10 local zj = "0`j'"
Each woman is exposed for exactly 36 months unless she married in the last three years, in which case we take the difference between the dates of marriage and interview. (One could count only half a month of exposure for the calendar month of marriage, but I will ignore this refinement, partly because we do count all births in that calendar month anyway.) We also need the midpoint of the window, so we can compute age and duration since first union at that time. All that remains is to fit the model using two terms to represent the effects of urban residence: a dummy variable for the spacing effect and an interaction with duration for the limiting effect (which I create to get a simpler name). The results show a spacing parameter of 0.008 and a limiting parameter of -0.025 for rural areas. Urban areas have essentially the same level of natural fertility (the difference of -0.097 is not significant), but significantly higher levels of limiting behavior (the difference of -0.467 is highly significant). We can translate these results into rates that may be easier to present. First we compute the mean age at first union of our sample, and notice that urban women married about 10 months later than rural women. The urban and rural total marital fertility rates are 4.17 and 6.70, a difference of two and a half children 20 years after the first union. 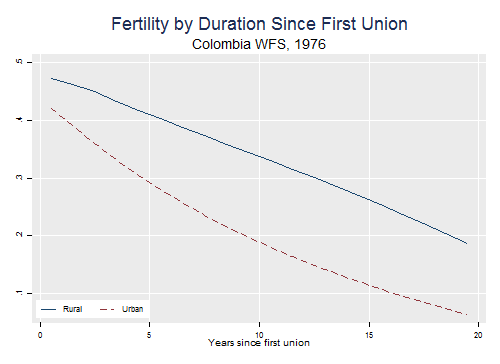 We see how fertility declines more steeply with duration of union in urban areas.